Gov. 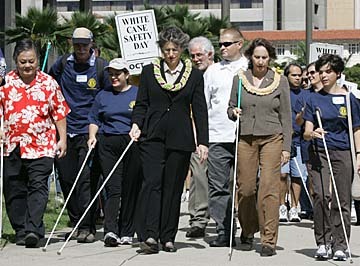 Linda Lingle, state Human Services Director Lillian Kohler and Braille instructor Brook Sexton, in foreground, along with 150 blind and visually impaired people and supporters, walked through downtown yesterday as part of White Cane Safety Awareness Day. The annual event aims to remind motorists to drive safely to help protect pedestrians who are blind or visually impaired.